The sandbox is self-contained and will not send any data to outside processing platforms (Visa, MC, or any banks). Charging a "live" credit card will not result in a charge showing up on the cardholder's bill. 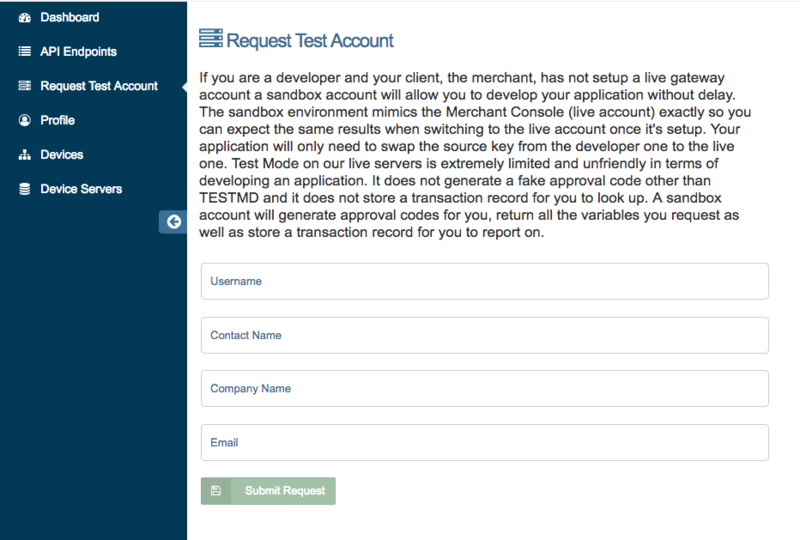 The sandbox is designed for testing functionality, and is not a load testing environment. Transaction throughput is intentionally throttled. The transaction database is cleared every few months. Requested Username- The username you would like to use to login to the sandbox account. Email- The email you would like the test account credentials sent to. Leaving any fields blank will delay your account setup. When complete click Submit Request. If successful, the message below will be shown. Processing time takes a few hours during regular office hours based on Pacific Standard Time. Requests on weekends may be processed with a 24 hour or more turnaround time. Once your sandbox account is created, you will receive an email with your login credentials. Login with these credentials at https://sandbox.usaepay.com/login.